Electric griddles are common household appliances that can make your life a lot easier. But with scores of different types of electric griddles out there, how do you know which one is right for you? The ReviewLab team sorted through countless electric griddle reviews, testimonials and manufacturer specs to create a list of the best griddles for your situation. We looked at factors like the size of the cooking surface, price point, versatility, ease of cleaning and storage and even-heating capabilities to make our final decisions. Read more about our methodology. The Secura GR-1503XL offers a large enough cooking surface and enough versatility to be used every single day in your home. Our top choice for best electric griddle can be used for breakfast, lunch and dinner. The reversible griddle/grill cooking plate makes it so you can cook meats, vegetables, breakfast foods and many other types of food. At a fraction of the price you will pay for more expensive models, the Presto 07047 delivers way above its price range. While it does not have a huge cooking surface, it offers enough space to cook for a small family and is useful no matter what type of meal you are cooking. The small price tag sealed the deal for the 07047 as our best on a budget pick. The Tilt ‘n’ Drain Big Griddle has a 23" x 17.25" cooking surface, larger than most griddles, making it great for cooking breakfast for a group. The nonstick surface offers true even heating. And the unique tilt feature and slide-out drip tray make for easier cleanup. 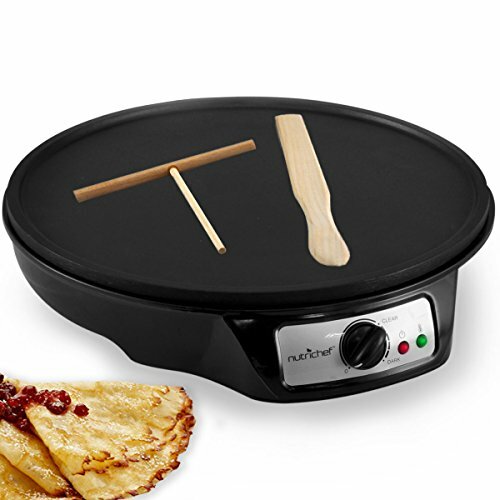 The NutriChef Electric Crepe Maker comes with the tools and the cooking surface you need to make piles of crepes, blintzes or pancakes. It was a no-brainer decision for the top electric griddle for crepes because of its proven ability to consistently make great crepes, not to mention its affordability. 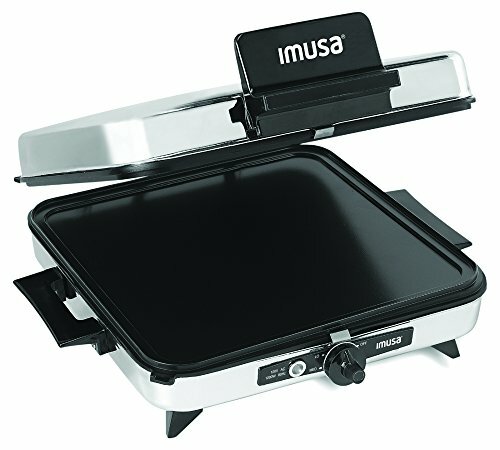 The IMUSA USA GAU-80302 lets you think beyond bacon, eggs and pancakes with waffle-making and sandwich pressing functionality. The combination of a reasonable price and the IMUSA’s 3-in-1 cooking capability (press, griddle and waffle maker) made it the clear choice for our best multifunctional electric griddle. The Dash DMS001BK packs a lot of functionality into a small package. 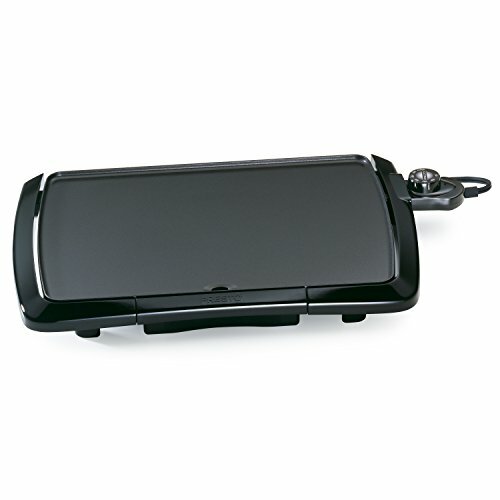 This electric griddle great for cooking smaller servings of breakfast foods, sandwiches and more. And it doesn't take up a lot of real estate, making it a great option for apartments, dorm rooms and other tight spaces. For people looking for a bit more cooking versatility in their electric griddle, your search is over. The Nesco ES-08 lets you sear, fry, bake, steam and simmer a wide range of different types of food. This versatility combined with its affordability made it the slam-dunk choice for our best covered electric griddle. Your situation dictates the size you need. If you’re cooking breakfast for four people regularly, you need a surface that’s large enough to handle the amount of food you’re cooking, but you also need enough space to store it. If you’re by yourself or using it for a couple, a smaller electric griddle will work just fine. Do you need a griddle that will only cook breakfast, or do you need one that you will be using for breakfast, lunch and dinner? The more features your electric griddle comes with, the more money you will have to spend, but you don’t want to be stuck with an underperforming unit. Before you purchase an electric griddle, consider what you need it for. Are you going to be grilling chicken and vegetables, pressing sandwiches or primarily making breakfast? Many low-end griddles do not offer true even heating, making it so part of your food cooks more quickly than the rest. This makes it difficult to cook large amounts of food on your griddle and also makes it likely that part of your food will end up undercooked or burnt. This is especially important if you have young children, but even the most experienced cooks can burn themselves badly on an electric griddle. Cool touch surfaces offer a safe area for you to touch and adjust your electric griddle without fear of burning yourself. Part of the convenience of an electric griddle is that you can cook an entire meal with just one tool as opposed to piling up pots and pans. That advantage is greatly diminished if your electric griddle is a hassle to clean. The best electric griddles are easy to clean by hand and often have dishwasher-safe cooking surfaces. Inexpensive electric griddles cost as little as $10, while the most expensive can exceed $100. The price you pay will be influenced by the size of the unit, the different functions it offers, the quality of the cooking surface, the precision of the automatic temperature control and several other features that make cooking and cleaning easier. 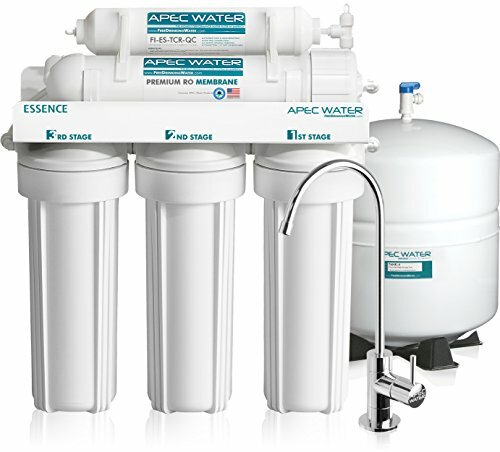 As with most products, more features will cost you extra, so you will have to determine which ones are important based on your household needs. If you want an electric griddle that can become one of your primary cooking tools in the kitchen, look no further than the Secura GR-1503XL. Its double-sided grill/griddle cooking surface opens up a world of culinary options, including eggs, bacon, grilled cheese, fish, vegetables, steak and almost anything else you could cook on your stovetop or outdoor grill. It offers a 15.5” x 11.5” cooking surface, which is large enough to cook a full meal for a small family in short order. 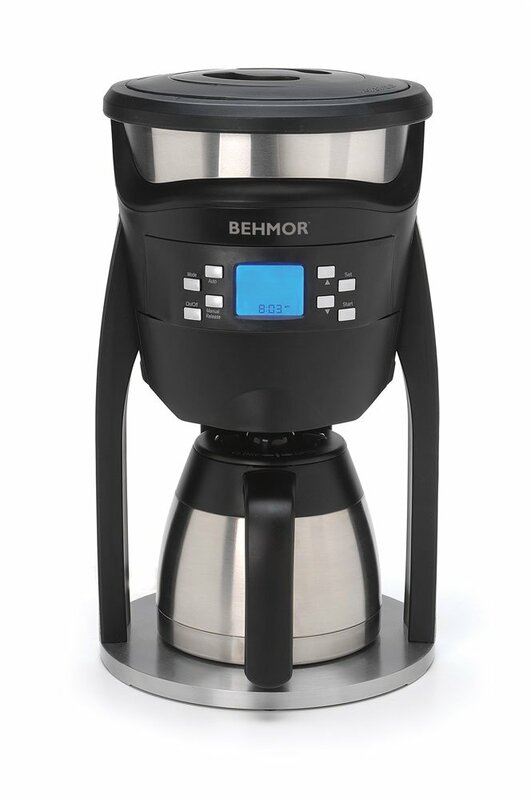 In addition, the removable glass lid helps prevent splatter and trap in heat to add to your temperature control. Grill and griddle combination. 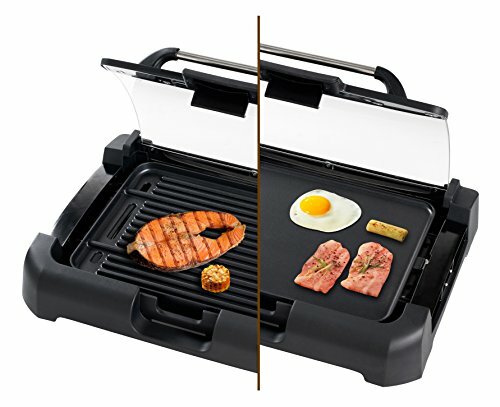 This is a reversible electric unit serves as both griddle and grill. The Secura’s double-sided cooking surface makes it so you can cook virtually anything. Easy to clean. The Secura comes apart easily, making for quick and efficient cleaning. Countless reviewers rave about how simple it is to clean up after cooking a large meal. Even heating. The manufacturer claim of even-heat distribution is backed up several reviewers who praised the Secura for cooking food at an even rate regardless of where it was on the surface. 1,700 watts. This is a very powerful electric griddle that takes a lot of power. Be careful about what else you have plugged into the same outlet. Complaints about the lid. Some reviewers complain that the lid does not stay on. However, it is removable, so using it is optional. As long as you aren’t cooking for a more than four people and you don’t need grill marks, the Presto 07047 will overperform relative to the price you’re paying. Its cool touch base makes it a safer household tool, it’s dishwasher safe and can be submerged in water (when the temperature control device is removed) and offers a 10.5" x 16" cooking surface – larger than mini units, but fairly standard for most electric griddles. Dishwasher and submersion-safe. As long as you remove the temperature control knob, you won’t have to worry about putting the cooking plate in the dishwasher or soaking it in water to clean it. Great for breakfast. Reviewer after reviewer raves about how well and quickly it cooks breakfast. If you like bacon, eggs, hash browns, pancakes and French toast, you will love the Presto 07047. Safe handling. The cool touch base makes this a relatively safe kitchen appliance, which is extremely important in households with children. Short power cord. Depending on the layout of your kitchen and where your outlets are located, you may need an extension cord to use this because of the short power cord. Slippery base. Be careful with how this electric griddle moves. Several reviewers comment about how slippery and wobbly it is because of the lack of rubber feet to grip the counter or table surface. While there are many uses for electric griddles, one of the most common is for breakfast. If you need an electric griddle mostly for making bacon, eggs, pancakes and other breakfast items, you should consider a griddle that only has a flat cooking surface, as opposed to one with grill lines or ridges. If you're cooking for a family, consider an electric griddle with a large cooking area. The Tilt ‘n’ Drain Big Griddle 23 is the perfect kitchen appliance for families that enjoy having large breakfasts. Its above-average cooking surface allows you to make rows of pancakes, eggs and bacon and reduce your overall cooking time when preparing breakfast, especially when compared to smaller griddles and standard kitchen pans. 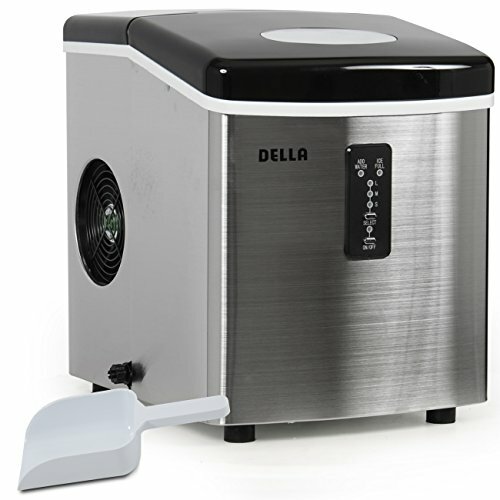 Its tilt feature makes clean up easier and it offers enough cooking versatility that you can also make meats, sandwiches and several other types of food. Huge cooking surface. Need to cook breakfast for a large family? The Tilt ‘n’ Drain Big Griddle 23 will make your life much easier. It offers an extra-large cooking surface that surpasses most other electric griddles, which means more bacon, eggs and pancakes with each use. The large surface is a favorite feature among reviewers. Cook more than just breakfast. This is a great electric griddle for breakfast, but you can also cook hamburgers, steaks or anything else you can make in a frying pan. Tilt feature helps with cleaning. The griddle tilts easily and creates a slope good for scraping off grease before putting it in the dishwasher or sink. Large size may make storage difficult. A larger cooking surface means that you need more cabinet space to store it. This is something you should consider before making the purchase. If you love crepes, then you'll love an electric griddle that will allow you to make your own crepes from the comfort of home. You'll want an electric griddle that offers the right temperature range, even heating, the proper tools and a cooking surface that's large enough to handle your needs. If you like crepes, you’ll be thrilled with the NutriChef Electric Crepe Maker. 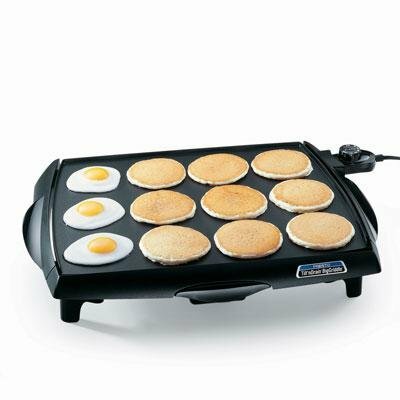 In addition, this 12-inch electric griddle can make pancakes, bacon and eggs, offering complete breakfast capability. It’s small enough to be a permanent fixture on virtually any kitchen countertop, or it can conveniently fit in most cabinets. It also offers an adjustable temperature control so you can have your crepes either dark, light or anywhere in between. Easy to use. The No. 1 feature referenced in positive reviews of the NutriChef was how is easy it is to use. The user manual comes with crepe recipes, the griddle heats up quickly (five minutes or less), it also comes with a crepe spreader and turner so you can properly make your crepes in just a few minutes. Not limited to just crepes. Although this is made for crepes, the NutriChef can make bacon, eggs, pancakes and even some sandwiches. Small size. You won’t have to worry about taking up too much space on your countertop or table, and it won’t hog your cabinet space either. Takes some time to master your crepe making. If you haven’t made crepes before, you will likely need to make a few before you get it right. Why get an electric griddle that only makes breakfast when you can get one that does so much more? Multifunctional electric griddles offer many more options to users, including making waffles, grilling meat and veggies, make sandwiches and paninis, and, of course, cooking pancakes, bacon and eggs. Make Paninis, waffles, eggs, bacon, meat, veggies and dozens of other types of food on the IMUSA USA GAU-80302. 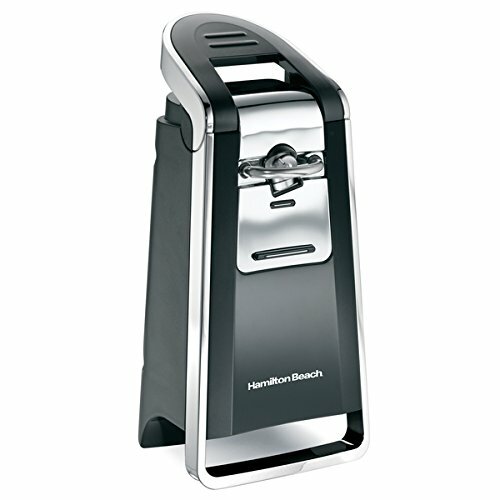 It comes with a beautiful stainless steel finish that makes it a great looking kitchen counter appliance, and its heavy-duty press makes it easy to make a wide range of different types of warm sandwiches. Its reversible cooking plate allows for maximum versatility for breakfast, lunch and dinner. Multiple cooking surfaces. This electric griddle makes so many things that it could effectively replace many of your cooking pans. 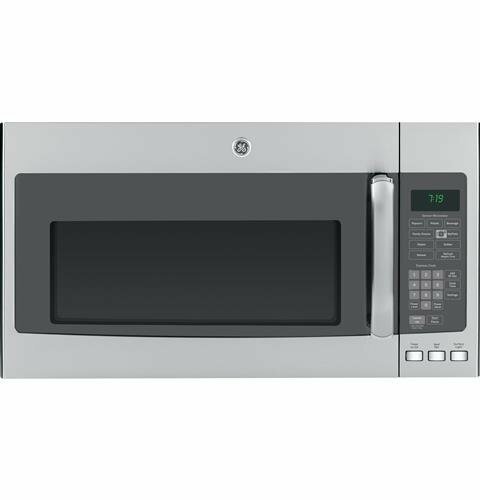 Its 3-1 cooking feature is perfect if you want one appliance that’s capable of making multiple types of food. Fast heating. Multiple reviewers praise how fast this electric griddle gets hot. You will be ready to start cooking within three-five minutes of turning it on. Great sandwich maker. Reviews often reference how well this unit makes sandwiches. The heavy duty press can accommodate thick sandwiches, as well as thin. Stainless steel surface will require regular cleaning. If you plan to display this appliance on your countertop, make sure you clean it regularly. Grease and grime will build up over time and make its shiny surface look less attractive if you don’t stay on top of the cleaning. Hot surface. Although there are cool touch handles, the surface gets extremely hot, which may be dangerous. No on/off switch. Some users complained about the lack of an on/off switch or an auto-power off function. Just be aware that you can only turn it on and off by plugging it in and unplugging it. Maybe you don't have the counter space or cabinet space for a large electric griddle. Perhaps you live alone and don't need a massive cooking surface. There are multiple reasons to choose a small electric griddle. You'll want to opt for one that can stand up to your cooking demands, despite being smaller and slightly less powerful than larger models. Virtually everything a person would look for in a standard size electric griddle can be found in the compact Dash DMS001BK. It weighs less than two pounds, comes with a recipe book, cleans easily and cooks quickly so you don’t spend longer than necessary making a simple breakfast for yourself. Perhaps its best feature is that it’s so small that it will easily fit in any storage area or right on top of your counter. Makes great pancakes quickly. Perhaps the most common word mentioned in all of the positive reviews about the Mini Maker is “pancakes.” Countless users rave about the electric griddle’s ability to produce perfect pancakes with amazing consistency. Many also mentioned using it for burgers and grilled cheese sandwiches. Easy cleanup. There’s nothing to remove or disassemble here. A damp cloth is all you need to keep this electric griddle clean. Recipes included. When you buy the Dash Mini Maker you get a recipe book and access to a growing online database of other recipes, allowing you to fully explore the possibilities. Extremely affordable. This is one of the least expensive electric grills on the market. It even comes with a one-year manufacturer warranty. Cooking plate is not removable. This is all one unit, so you can’t remove the plate and put it in the dishwasher. Not meant to feed a crowd. The Mini Maker is designed to create single servings. Covered electric griddles offer users the ability to prevent spills and splatter, while also trapping heat and moisture for more efficient cooking and better-tasting food. The deeper cooking surface also makes it function as an effective skillet as well, expanding your cooking options. 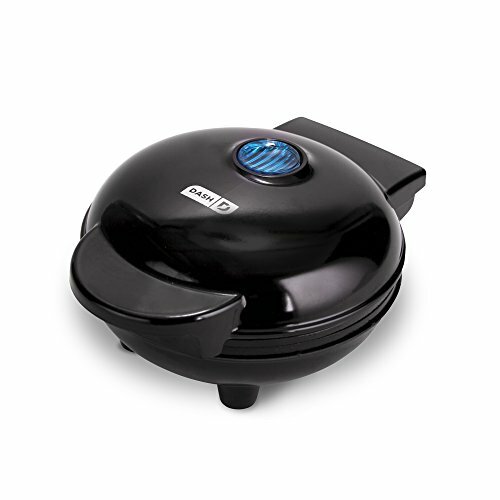 The Nesco ES-08 is a unique product in this category because of its ability to do more than just sear and grill. It has an 8-inch deep skillet, which makes it useful for frying, baking, searing and steaming. You won’t have to be limited to just breakfast and burgers, and its great price point makes it an even more enticing buy. 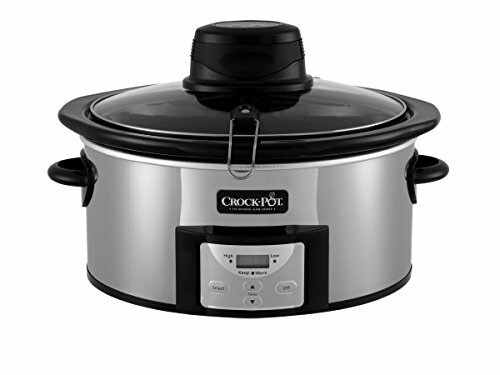 This is an ideal cooking appliance for people who need to make one or two portions at a time as opposed as to people with higher cooking demands. Its sturdy cover is dishwasher-safe and allows you to keep heat and moisture trapped in while also avoiding splatter. Superior cooking versatility. The Nesco’s deep skillet allows you to cook virtually anything, according to reviewers. They mention cooking eggs, pasta, potatoes, fondue, pancakes, frozen pizza and vegetables, to name a few. Ideal compact size. This is perfect for people who travel a lot, students, singles or couples. And since it offers so much cooking versatility, you may not need much more than this skillet for most of your meals. Sturdy cover. The cover on this electric skillet is helpful because it prevents splatter (especially useful for frying foods with hot oil), maintains heat and retains moisture. It’s also dishwasher safe. Not dishwasher-safe. You cannot place this unit in your dishwasher or submerge it in water to clean it, unlike many other models. Only the lid is dishwasher safe. Complaints about uneven heating. Some reviewers who complain about hot spots and inconsistent heat throughout the cooking surface.